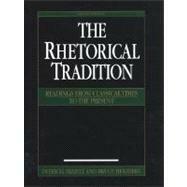 The Rhetorical Tradition the first comprehensive anthology of primary texts covering the history of rhetoric examines rhetorical theory from classical antiquity through the modern period. Extensive editorial material makes it an essential text for the beginning student as well as the professional scholar. PATRICIA BIZZELL (Ph.D. Rutgers University) is professor of English at the College of the Holy Cross. With Bruce Herzberg she has published Negotiating Difference (Bedford/St. Martin's, 1996), and with Bruce Herzberg and Nedra Reynolds, The Bedford Bibliography for Teachers of Writing, Fifth Edition (Bedford/St. Martin's, 2000). BRUCE HERZBERG (Ph.D. Rutgers University) is professor and Chair of English at Bentley College. With Patricia Bizzell he has published Negotiating Difference (Bedford/St. Martin's, 1996), and with Patricia Bizzell and Nedra Reynolds, The Bedford Bibliography for Teachers of Writing, Fifth Edition (Bedford/St. Martin's, 2000). Rhetoric under Siege in Europe to 1000 C.E.